This PawHut bird cage is a great home for your pet, It gives a great space for your pet to fly around and stretch and will not make them feel enclosed in tight. This is a great place for larger birds to freely move and exercise. 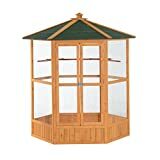 Made from fir wood and designed in a hexagon shape, the cage is large and comfortable for the birds. There is an opening via two doors, which is big enough for birds to come in and out.